Southwest Harbor scallop diver Andy Mays cuts out the innards of a scallop on his boat Lost Airmen in March 2017. 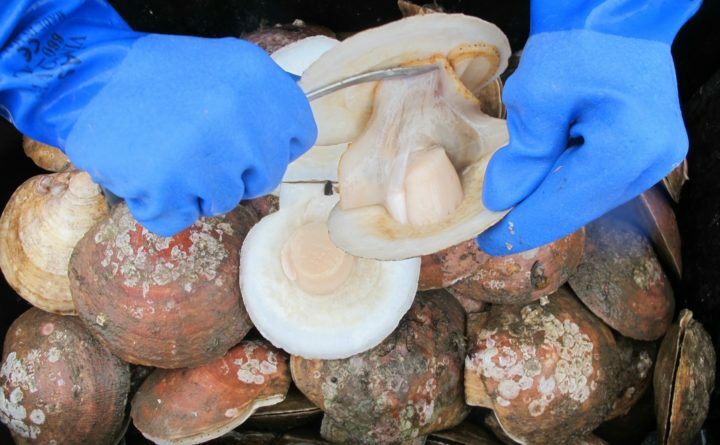 State officials are considering implementing a lottery system to issue new licenses for the scallop fishery for the first time since 2009. File photo. Nearly a decade after halting new licenses for scallop fishing to protect the stock from depletion, Maine is considering how to encourage new people into the fishery. Prices for scallops remain historically high, and Maine’s scallop fishermen are getting older, prompting the state to contemplate adopting a lottery system for new licenses. The average age for licensed scallop fishermen in Maine is 51. Maine’s Department of Marine Resources stopped issuing new scallop fishing licenses eight years ago, when the state fishery was floundering from declining stocks. A new fishery management scheme the state developed and implemented since then has helped stocks recover. The department now wants to develop a system to start issuing new licenses again but, at the same time, protect the long-term stability of the fishery. DMR officials have said they would like to reduce the number of licenses in the fishery while simultaneously letting new people in, but they are not looking to reduce the number of licenses by a specific amount. There are approximately 630 licensed scallop fishermen in Maine. Nearly 90 percent drag for the shellfish with nets by boat while the rest dive to collect them by hand. The state is mulling issuing two new dragging licenses — one for a lottery applicant between the ages of 18 and 31, and another for someone at least 31 years old — for every three dragger fishermen who decide not to renew their licenses. One new diver license would be issued for each licensed diver who decides not to renew. But most scallop fishermen who spoke at a public hearing in Ellsworth last week didn’t like the idea of a lottery. A few said they would rather see an apprentice program similar to the lobster fishery, in which a prospective scallop fisherman has to work a couple of years for a licensed fishermen before he or she can get a license of their own. Others said they would like to offer their license to their son or daughter one day or maybe sell it for an amount capped by the state. “That way, [young people] could get into the fishery” for a reasonable cost, said Hancock scallop dragger James West. The concept of a lottery — also used to issue licenses for elver fishing — is supported by the department’s scallop advisory council, which is comprised mainly of scallop divers, draggers and dealers. Not all fishermen want to bring more people into the fishery, however. The price offered to fishermen has improved dramatically over the past 12 years, rising from $4 per pound in 2004 to a record high of nearly $13 per pound last year. But the number of days fishermen can go out annually has been reduced sharply from 130 roughly a decade ago to around 60, depending where along the coast they fish. Some fishermen have said they’d prefer more days to harvest scallops, or an increase in the daily catch limit, rather than let anyone new into the fishery. “This proposal is bogus,” Stonington fisherman Robbie Gray said. The season should be “fixed,” he added, to allow more days before the state grants new licenses to fishermen who don’t have one already. Maine’s scallop fishery had its heyday in the 1980s, when annual harvests peaked at more than 3 million pounds of scallop meat a year. That catch rate was unsustainable, however, causing landings to fall steadily to fewer than 100,000 pounds a year in 2004 and 2005. Since a new management system was implemented in 2009, catches have improved. For the past four years, annual harvests have ranged from roughly 500,000 to 600,000 pounds — 10 times the amount harvested statewide in 2004. The cumulative value of the statewide catch last year was $6.8 million, the fishery’s second-highest total since 1996. But as the fishery has recovered, it has become more attractive to pursue. Many fishermen got licenses just before the freeze on new licenses went into effect in 2009, but not all actually fished for scallops when catches were low. Now that catch volumes and the price have increased, more of those so-called “latent” licenses are being put to use, resulting in more competition on the water. Deirdre Gilbert, DMR’s director of marine policy, said any new lottery system would not go into effect this coming scallop season, which is scheduled to start in early December and run through mid-April. The Legislature would have to approve a license lottery, which means it likely would be late 2018 or early 2019 before such a system would be implemented. DMR also held recent hearings in Machias and Augusta to get feedback about the lottery proposal. Fishermen have until Oct. 23 to submit written comments about the idea.